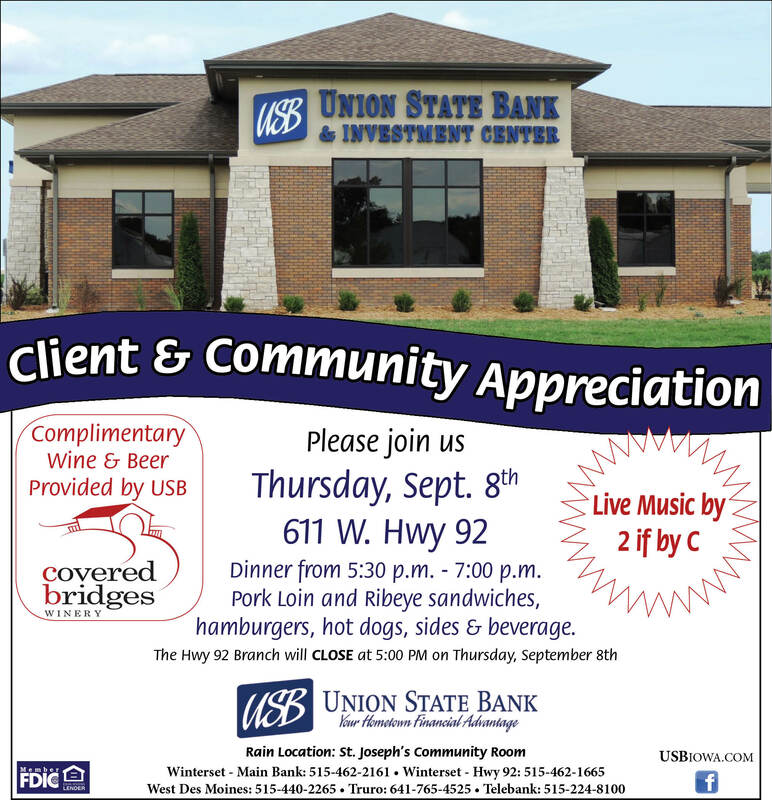 Get an early start on your Labor Day weekend festivities by attending Farmers & Merchants State Bank’s annual Customer Appreciation Lunch today from 11:00 am to 1:00 pm. 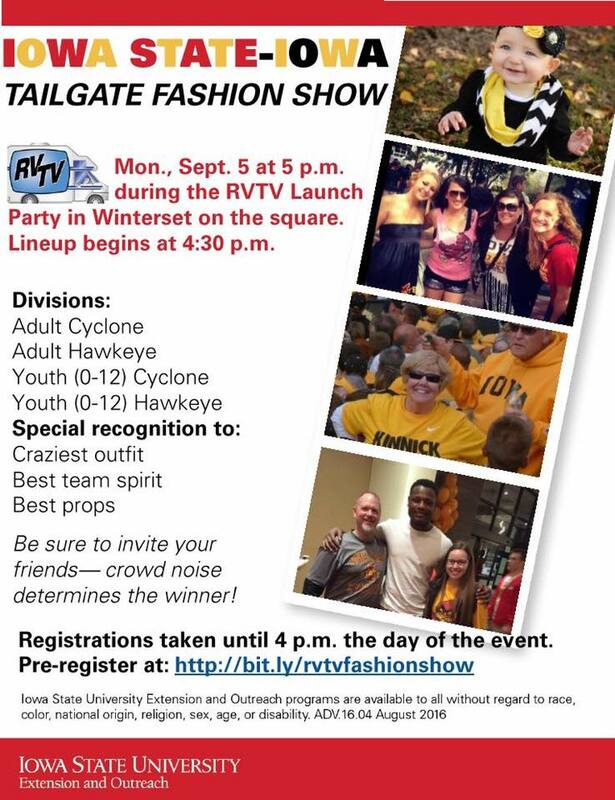 This is always a fun outdoor event, and businesses all around the square will likely be dressed up in team colors for the RVTV Launch Party happening on Monday. Lunch + window shopping sounds like a great start to a three-day weekend! Of course you can also catch the Madison County Farmers Market on Saturday morning from 8:00 am to noon, and then it’s on to the party we’ve all been looking forward to — the RVTV Launch Party, live from the Winterset square on Labor Day. Are you ready to show off your team spirit? 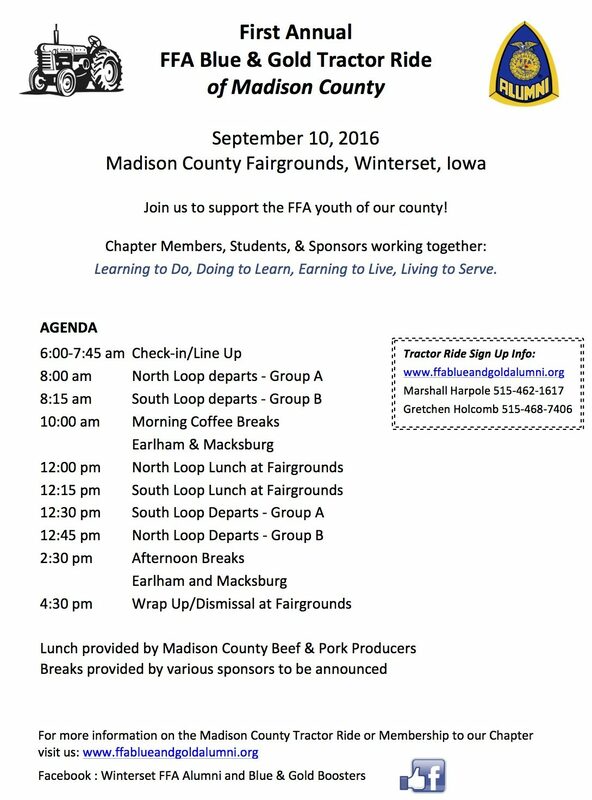 If so, you can still enter to win the Tailgate Fashion Show sponsored by Madison County ISU Extension & Outreach, as seen below! In addition to a great lineup of events, local RVTV party organizers have organized a feast. Bring your appetite to the square on Monday! Fareway, Hy-Vee and Rodells will provide food concessions. 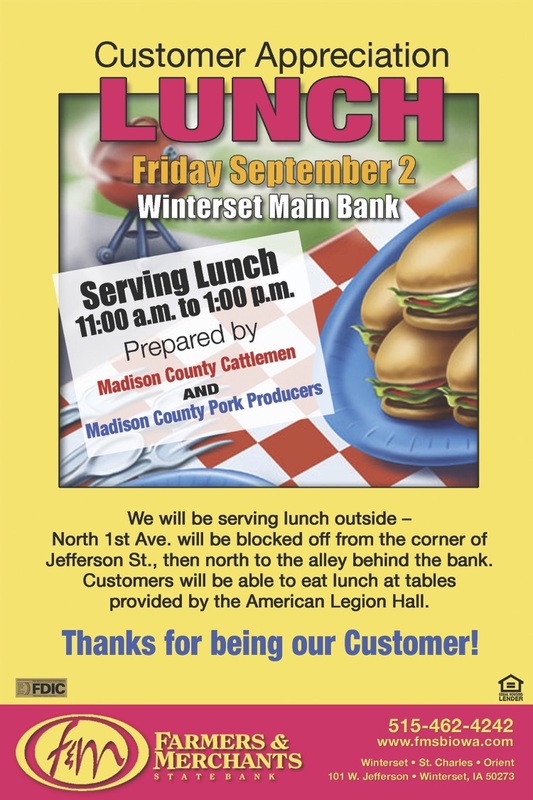 The Madison County Leadership Institute will be providing homemade ice cream; the local boy scout troop will have popcorn tins; the Winterset Band Boosters will have root beer floats; the Chamber will have a lemonade stand, and Farmers & Merchants State Bank will be selling popcorn from 3:00 to 9:00 pm with proceeds going to the Winterset Quarterback Club. The event will be broadcast live at 4:00, 5:00, 6:00 and 10:00 pm, and the honorary co-chairs (Sam Anker and Loren Gerleman of Winterset) have agreed: Based on votes cast by YOU during the festivities, one of them will be receiving a pie in the face on live TV at 10:00 pm. 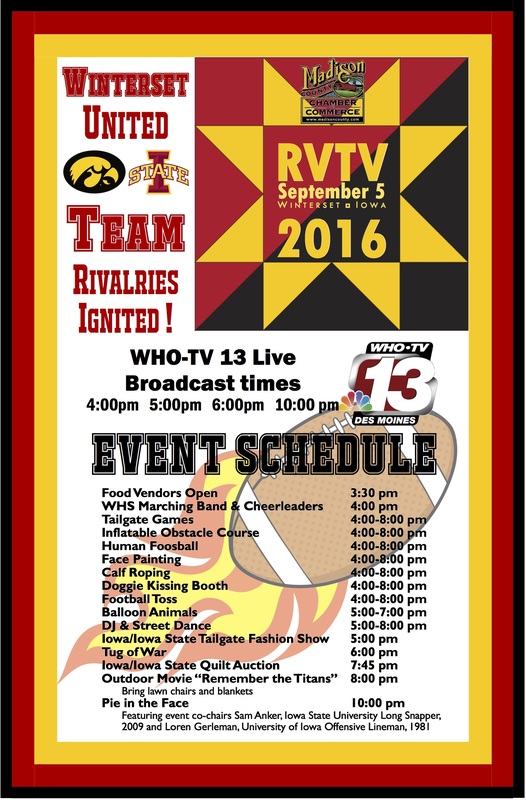 Follow Winterset’s RVTV Launch Party page on Facebook for more details, and see the poster below for the lineup of events. 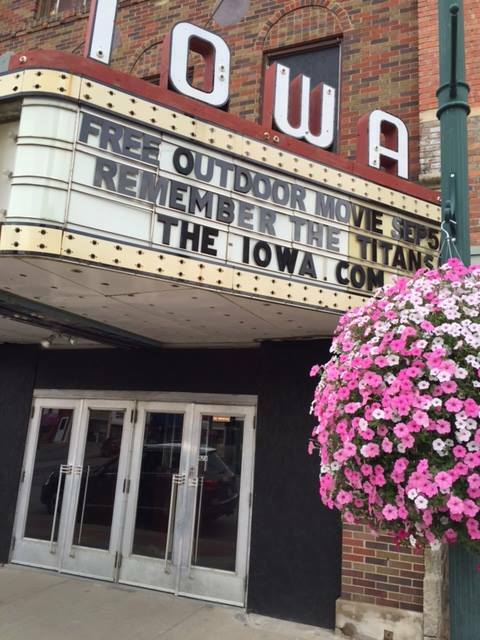 “Remember the Titans” is playing on the big outdoor screen at 8:00 on Monday during the RVTV Party — bring your blanket and lawn chair! 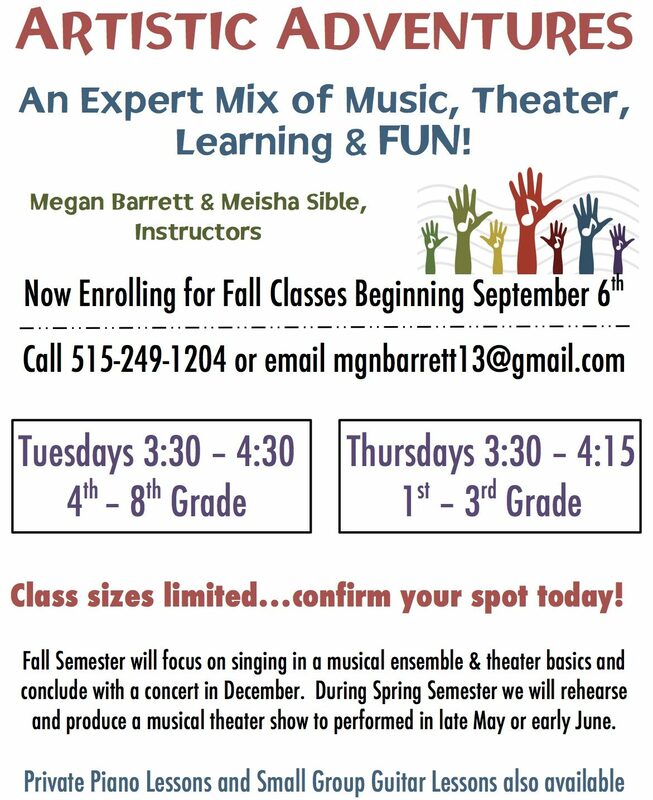 Megan Barrett and Meisha Sible are offering a new line of classes for kids interested in music and theater, and the start date is September 6th — enrolling now! Click here for a registration form, or visit their website at www.HaveArtisticAdventures.com for more information. Beginning September 8th, HCI Hospice Care Services of South Central Iowa, Kale Funeral Home and Madison County Health Systems will be offering an educational grief support group, “Understanding Your Grief,” using material from Dr. Alan Wolfelt and the Center for Loss and Life Transition. “Understanding Your Grief” will meet for eight weeks on Thursdays, September 8 – October 27, 5:00 – 6:30 PM, in the Chesnut Building Education Room, located at 901 S. 4th Ave., in Winterset. Pre-registration is required as seats are limited. Please contact HCI Hospice Care Services Bereavement Counselor, Mike Albert, at 515-462-5205 for more information or to register. The group, as well as the book and accompanying journal, are free and open to the public. Friends of the Library is at it again! For years, the organization has held used book sales at least annually. They give the proceeds to the Library for purchase of new library materials. 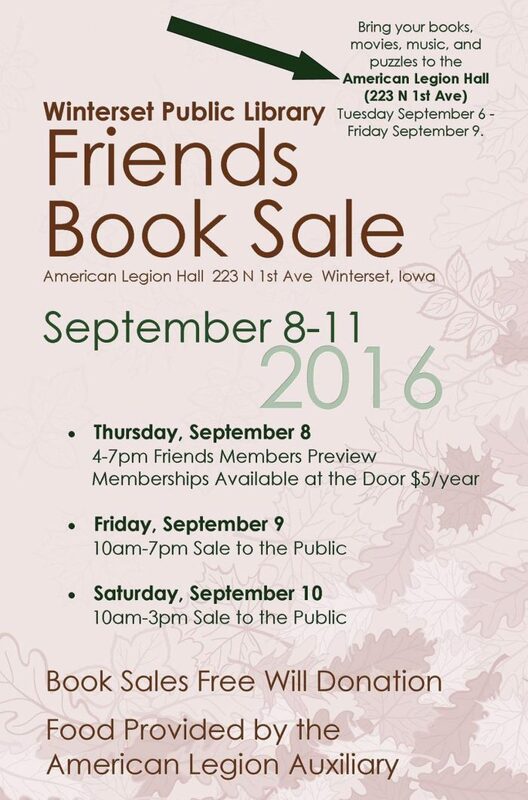 This year the Friends of the Library Used Book Sale will be held at the American Legion Hall on Sept. 9 from 10:00 am-7:00 pm, and Sept. 10 from 10:00 am-3:00 pm. Additionally, a preview will be open to Friends members on Sept. 8, from 4:00-7:00 pm. Memberships are available at the door with the options of $5 annual, $25 supporting, and $100 lifetime. The American Legion Auxiliary will be serving sandwiches and goodies during the sale. Prices are excellent (free-will donation!). No boxes or scanners allowed, and shopping bags will be provided. Donations of clean, used books will be taken at the Legion Hall starting Sept. 6 at 10:00 am. 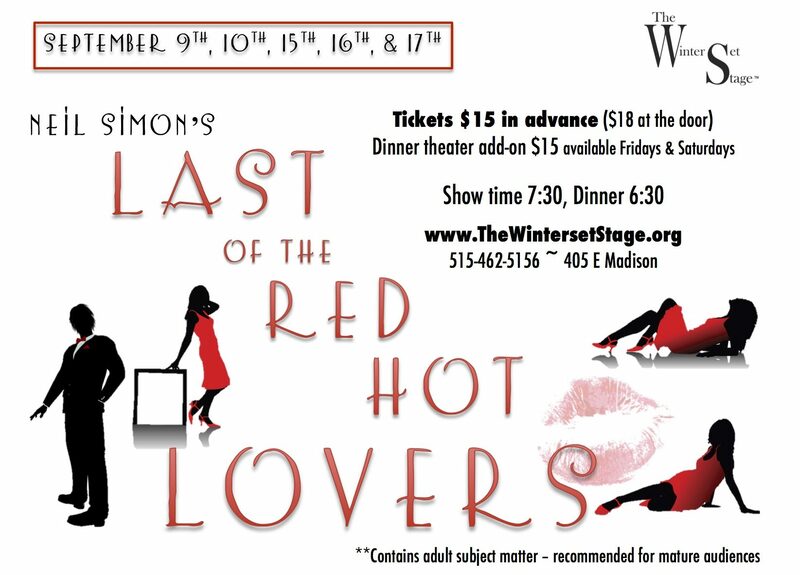 A new show is opening at The Winterset Stage on September 9th : Neil Simon’s Last of the Red Hot Lovers! Middle-aged and married, overworked and overweight, Barney Cashman wants to join the sexual revolution before it’s too late and arranges three seductions: the first, Elaine Navazio proves to be a foul-mouthed bundle of neuroses; Bobbi Michele is next, a 20-ish actress who’s too kooky by half; finally comes September and Jeanette Fisher, a gloomy, depressed housewife who happens to be married to Barney’s best friend. The show contains some adult-themed content and is recommended for mature audiences. It stars Jon Barrett, Heidi Bibler, Summer Hansen and Meredith McKay, and is directed by James Serpento. 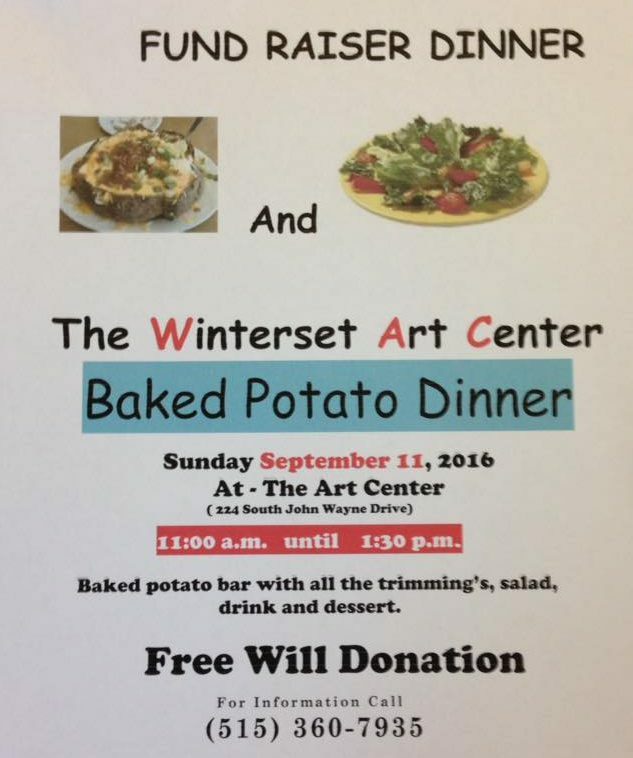 The Winterset Art Center is hosting their annual fall Baked Potato Dinner Fundraiser on September 11th from 11:00 am to 1:30 pm. 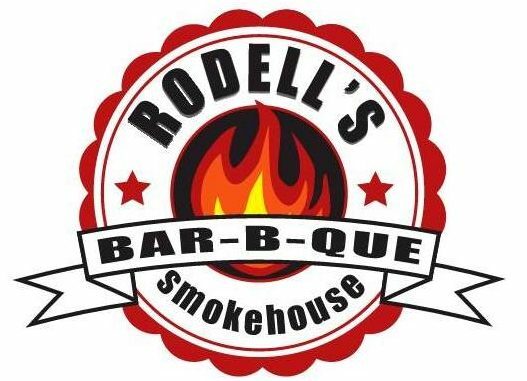 If you have potatoes for lunch and Rodell’s barbecue for supper, you won’t have to cook all day on September 11th! 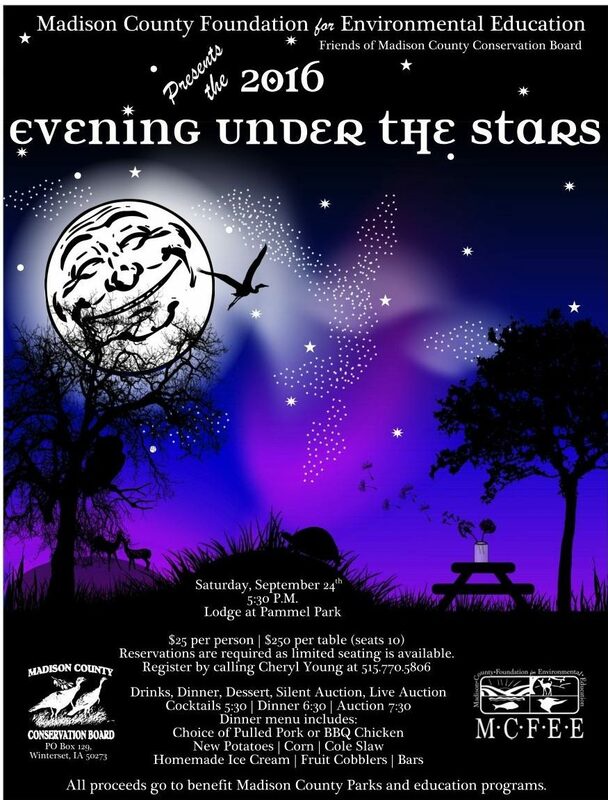 Finally, the Madison County Foundation for Environmental Education (MCFEE) invites you to join them for an Evening Under the Stars to help support our beautiful Madison County Parks and the education programs our conservation staff provide.